Upstairs are 3 bedrooms(1 queen, 2 with 2 single beds), bathroom(toilet,hand basin and shower) with open plan living at includes lounge, dinning and kitchen, along with large deck around lounge area. Has small bathroom that has toilet, shower and hand basin. Downstairs are 2 bedrooms, a large room with queen bed and a set of bunks; and a small room off this large one with 2 single beds,shower, toilet. laundry, extra fridge and room to store boggy boards, buckets, etc. I ask for $100 cleaning fee, which is a bond. This is to be paid directly to me about 1 week prior to renting. This money will be refunded to you if the house is left clean, or you have the option to use the $100 to pay for the house to be cleaned. Access to beach is on the right hand side of property down rock high tide water is up to base of the rock pedestrian access to beach is within 100metres on either side of property. Waihi Beach has a great beach, safe for children to swim with good surfing conditions.There is fishing in the Bowentown harbour, which has easy access to launch the boat, also a very safe beach for children to swim in. Check in time can in be in morning if no other renter is leaving that day, otherwise 1pm. Checkout time can be late afternoon, if no one else is using the place, otherwise 11am. The township is small but provides amenities like cafes,clothing shops, restaurants, sporting equipment,supermarkets, butcher, chemist, wine shop.This is within easy walking distance from house. There are walks to another beach or through the Karangahake gorge/tunnel to see the surrounding cliffs, plants and river, this can also be biked.History of gold mining in the area,provides people the opportunity to experience gold mining and visit a museum,There is a train from waihi to wakino, travelling through the relics of mining to a cafe in the gorge. Or at the southern end is bownentown where launching of boats is easy along with another safe harbour beach. Good for children. About 50mins drive south, to visit the city of Tauranga and Mount Maunganui. The property itself provides plenty of off street parking,with enough grass area in front of the house to play ball/cricket. There is no internal access,walk along decking, downstairs to ground level. $100 cleaning fee as a bond is required to be paid directly to me about 1 week prior to renting. This will be refunded when the house is left clean, or the money can be used to pay for a cleaner. Extras: Cleaning NZ$100.00 per stay, this is to be paid to owner, will be refunded when house is left clean. Great location. Logistics with Wendy (owner) were easy and worked. A dishwasher would be a valuable addition. Loved staying at Wendy’s property! Excellent communication leading up to our stay, and Larry and Tina are lovely (key pick up and general welcome) The house is unpretentious and looks like it has been a much loved holiday home. The living area is outstanding and we were lucky enough to have perfect weather, so we could open up the folding windows and enjoy the fresh air and fantastic views! The water literally is at the end of the lawn...so beautiful and relaxing! Highly recommend yoga on the lawn at sunrise! 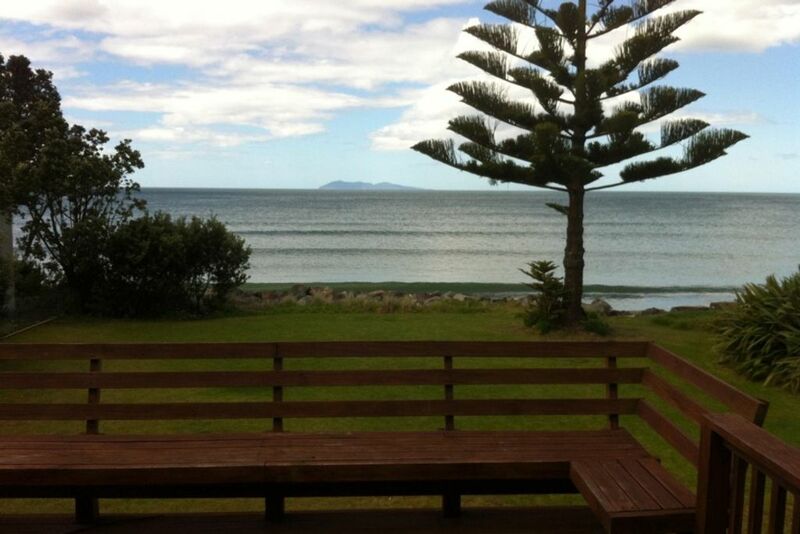 Great place to stay for a family or group of friends looking for a good kiwi bach! Had an extended family weekend get away making full use of the 12 beds available. The property worked great for us and never felt crowded. The location was amazing. We all loved that we were able to have a late check out and thoroughly enjoyed this time sitting at the end of the lawn with coffees in hand admiring the stunning scenery with the waves just below. Older style kiwi bach in a great location, wake up and see the sea rolling in at the bottom of the lawn... down the road is the best cafe in Waihi Beach - Flat White. Enjoyed a short break here after an impromptu decision to book it for the next day - no problem for Wendy, all confirmed and we arrived within 24 hours of making the booking! Thanks for the opportunity to stay.